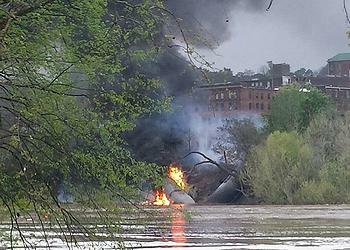 WASHINGTON, DC, April 19, 2015 (ENS) – Responding to the unprecedented number of recent fiery oil train derailments, the U.S. Department of Transportation Friday issued an Emergency Order requiring trains carrying large amounts of Class 3 flammable liquid through highly populated areas to go no faster than 40 miles per hour. The Emergency Order covers any “High Threat Urban Area,” which is defined as one or more cities and surrounding areas including a 10-mile buffer zone. The Order applies to trains with 20 or more loaded tank cars in a continuous block, or 35 or more tank cars loaded with Class 3 flammable liquid; and at least one older model DOT 111 tank car loaded with a Class 3 flammable liquid. A Class 3 flammable liquid is a liquid that burns readily in the presence of heat and oxygen. Examples include all hydrocarbons such as crude oil, ethanol and gasoline, oil based paint, thinners, paint removers and solvents. The volume of crude oil being shipped by rail has increased exponentially since 2008, and the number of major accidents involving trains carrying ethanol or crude oil is unprecedented, said Transportation Secretary Anthony Foxx. “The boom in crude oil production, and transportation of that crude, poses a serious threat to public safety,” said Foxx. “The measures we are announcing today are a result of lessons learned from recent accidents and are steps we are able to take today to improve safety. Our efforts in partnership with agencies throughout this administration show that this is more than a transportation issue, and we are not done yet,” he said. Since 2013 there have been 23 crude-related train accidents in the United States. The DOT says the majority of these incidents occurred without the release of any crude oil product. But when oil trains derail the explosions can be dramatic. On February 16, fireballs erupted as a CSX freight train carrying oil derailed near the town of Mount Carbon, in south-central West Virginia. 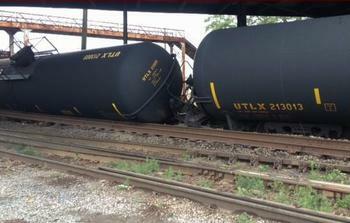 At least 14 tank cars were on fire following the derailment, and some cars exploded. On March 5 a BNSF oil train derailment and spill in northwest Illinois posed what the U.S. Environmental Protection Agency called an “imminent and substantial danger” of contaminating the Mississippi River. “The added federal directives build on the many practices and protocols the industry has applied for years for safely moving and handling hazardous materials by rail, including flammable liquids,” said Hamberger. The actions announced Friday are the latest in a series of more than two dozen that DOT has initiated over the last 19 months to address the threat to public safety that accidents involving trains carrying highly flammable liquids represent. The agency also issued two Safety Advisories, and notices to industry intended to ensure the safe shipment of Class 3 flammable liquids. The DOT said that preliminary investigation of one recent derailment indicates that a mechanical defect involving a broken tank car wheel may have caused or contributed to the incident. As a result, the Federal Railroad Administration, FRA, is recommending that only the highest skilled inspectors conduct brake and mechanical inspections of trains transporting large quantities of flammable liquids, and that industry decrease the threshold for wayside detectors that measure wheel impacts, to ensure the wheel integrity of tank cars in those trains. Recent accidents revealed that certain critical information about the train and its cargo needs to be immediately available for use by emergency responders or federal investigators who arrive on scene shortly after an incident. 24-hour telephone number for immediate access to product information. Information on the train, including the train number, locomotives, locomotives as distributed power, end-of-train device information, number and position of tank cars in the train, tank car reporting marks, and the tank car specifications and relevant attributes of the tank cars in the train. Date of acceptance as required to be noted on shipping papers under 49 CFR § 174.24. The identification of the company having initial testing performed and information on the lab conducting the analysis. Name and location of the company transporting the material from well head to loading facility or terminal. Name and location of the company that owns and that operates the terminal or loading facility that loaded the product for rail transportation. Name of the Railroad handling the tank car at any time from point of origin to destination and a timeline of handling changes between railroads. FRA is sending a request to the Association of American Railroads asking the industry to develop a formal process by which this specific information becomes available to both emergency responders and investigators. These actions coincide with actions being taken by other government agencies including the Department of Homeland Security, the Federal Emergency Management Agency, the Environmental Protection Agency and the Department of Energy.